On Monday, in Precalculus, I am starting conic sections. I’ve made the decision to introduce conics through polar equations. This is totally backwards to the way that most people do it. Our textbook even sticks the polar version of conics at the end of the chapter of conics. However, I think it will be more powerful to do it this way. You see, we just finished a unit on polar a hot minute ago, and I want to capitalize on that so students can draw connections between polar and conics. Additionally, we did a project on families of curves. And in case you didn’t know this, the polar equation  give rise to all the conic sections by varying the parameter . In other words, you can see all conics as a family of curves with a varying parameter. I’m handing out this worksheet [.docx] to get us to do these things. I don’t know how long this will take. Maybe 20 minutes, maybe 50 minutes? It really depends on how into the noticing and wondering. I’m a little uncertain where to go next with this — how to share the noticing and wondering… Each pair is going to have a group letter (A, B, C, … H, I, J). So I might have them spend a few minutes looking at the documents of those that preceed and follow their group (e.g. C will look at group B and D’s group’s observation). Then I’m not sure how to wrap this all up. I think what I may do is leave it there, and not do a whole-class share. But after that, I’ll collate their noticings and wonderings, and as we introduce new things, I’ll tie them back to statements from these documents. For example, if a group notices “when is a huge number, the graph looks like two intersecting lines,” when we get to hyperbolas, I’ll start the day reading that statement, and after delving into them, we’ll return back to that statement to see how it relates to the algebraic work we did. Or if a group wonders, “When , I wonder if there’s a relationship between the value of and the angle between the two intersecting lines,” I could build that into the questions in the worksheets I’m writing for this unit. Or maybe I’ll do nothing with them. Just the mere act of exploring, and coming with the conclusion that one family of polar curves can general four distinct general shapes (circle, ellipse, parabola, hyperbola) is good enough for me. Just paying attention to what’s happening to the graph, and learning to ask questions about what’s happening, that’s a skill in itself I should be content with cultivating. And since we aren’t relying too much on the textbook, I am going to want them to make a schematic chart to organize what they’ve uncovered through observation. This is all subject to change, obviously. Then we can get to the rectangular form for conics and see how they come to look so similar, and why the differences arises… Why certain things open up and certain things open sideways… all the traditional stuff… But motivated by this untraditional beginning. UPDATE: It’s Sunday, before I try this on Monday. I decided I want kids to understand why hyperbolas have asymptotic behavior from the polar form (and why ellipses don’t!). So I made this sheet [scribd online, .docx] which I think will get them to discover some algebraic connections behind some of the visual things they will have uncovered from their noticing and wondering. I’m in the middle of Paul Lockhart’s Measurement and what’s amazing is I was reading it on the subway to school, and today of all days, I started his introduction to conics. He introduces it in a stunning way, through projections, and showed me one of the most elegant proofs I’ve seen dealing with ellipses and why the sum of the distances from the foci to the ellipse is a constant. I wish I could move away from our traditional curriculum to work as qualitatively and beautifully as he has done. ← Dan Meyer says JUMP and I shout HOW HIGH? I’m curious, would you ever make a connection to Kepler’s laws of planetary motion? In my college physics class, we work hard on the dynamics of Newtonian gravitational motion, massaging our results until we get to what you would recognize as the polar form of a conic section. Unfortunately, my students stare blankly at it until I tell them it’s the formula for a conic section. I really wish they would say “hey, wow! This explains Kepler’s first law!” But I’m still waiting for that. Haha, in multivariable calculus, we derive that planets move in a conic (hence, using deduction, ellipse) and generate the polar form for the conic. And yes, my kids don’t see that, because we rush through it in precalc. > I wish I could move away from our traditional curriculum to work as qualitatively and beautifully as he has done. Sounds like that’s what you’re doing. Thanks! At least I hope I’m working towards doing that! Quick question here – I’ve been in love with GeoGebra but I am beginning to see more references to Desmos. Any quick advice on the pros and cons of these programs? I love love love Geogebra so that has my heart. The thing when I was doing polar is that Geogebra doesn’t yet have polar functionality build in. So I’ve been using Desmos for that, becuase it does a fabulous job. Geogebra has a ton more functionality than Desmos — especially for dealing with creating dynamic illustrations. So of the two, if I had to pick one to live and one to die, I’d pick Geogebra. 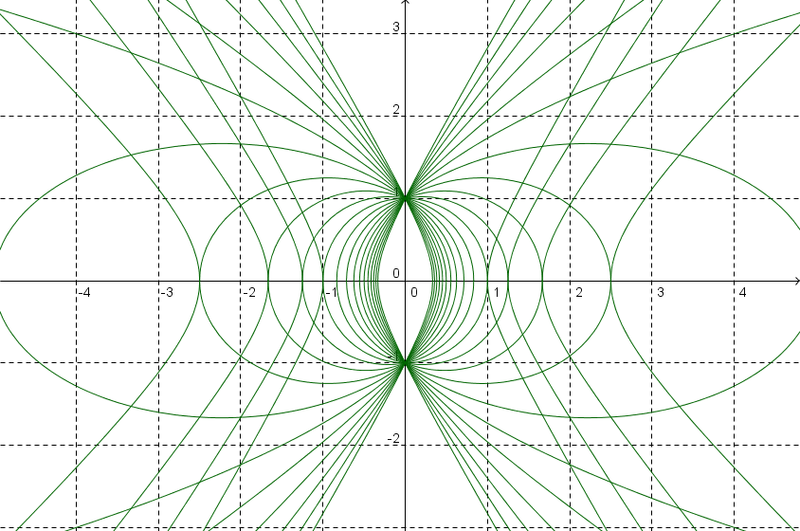 Desmos is mainly a great (phenominal) graphing tool. But what’s nice is that since it is web based, you can send a link of a page you have with graphs on it to kids as a link. And if students create accounts, they can save pages they’ve created in a little online respository. So those are two benefits of Desmos. Interesting. The family of graphs image is mesmerizing – reminds of some other project I think you did where kids made these wild graphs using families of trig functions. Desmos is really neat for demonstrating what happens as a parameter slides towards an important value as well.
. The missing details (length of chain & distance between foci) will be provided as needed/requested. I don’t believe the usual development of the formula (pyth th. & messy algebra with roots) would result in much more than glazed eyes (mine & theirs). Wouldn’t be a proof, but maybe we could guess our way to the ellipse formula by thinking of a circle as y^2 = r^2 – x^2 and thinking about what we need to change to make the domain and range work out. Any other ideas? I love this as an intro! Because of time I don’t think I can do this this year. However, maybe next year? This year I think I’m going to work on doing something like http://www.scribd.com/doc/135025418/2013-04-12-Ellipses … both conceptual and procedural. I like the use of polar functions to introduce conic sections. It is very unifying, and it even gives access to the rectangular equations. The cone and plane explanation does not seem to provide the quadratic equations in any accessible way. But then the polar equation doesn’t tell me anything about cones. I just made this video of something I started doing with conic sections using shadows and a flashlight. If I could figure out what k has to do with the flashlight, I’d be all set. Nate, this is aweeesome. I am definitely showing it to my kids!!! Thank you for sharing. As for the k and the flashlight… isn’t the k sort of like the “slope” of the plane that intersects the double cone? So for k=0, you get a perfect circle. Then as the plane tilts upwards, until k=1, you get an ellipse. Then at k=1, a perfect tilting of the plane so that the plane is parallel to your double cone, you get a perfect parabola. And then as soon as you tilt a tiny bit more, your plane intersects the other half of the cone, generating a hyperbola (so for k>1)? The slope of the plane isn’t the whole thing though, right? You have to know how far from the center the plane is. I’m also picturing hyperbolas whose asymptotes make an angle greater than pi/2. Having a parabola at k=1 assumes something about the cones, and the same assumption does not seem to permit some conics. All that is true. It’s more that I was just thinking k and the angle were very related. I used the numbers to show how I saw them related, but it’s not quite right. I now see you fundamental question! Love it! Here’s a proof of the conic property: http://art-of-logic.blogspot.com/2014/09/conics.html. Thanks, Sam!